I have been looking after my friend Ali's chickens all week while she's been on holiday. Every evening, I went and shut them in and prepared their food for the next day, and I was rewarded with superfresh eggs. The boks have only been living with Ali in their Eglu for about a month so one has only recently started laying, and another started this week, just as the first bok's eggs got to be normal sized. I made a lovely lunch of this first normal sized egg, which turned out to be a double yolker, and a mini one, on some absolutely delicious seedy bread from Turner's. It was all really fresh and tasty. Yum! Apparently, when chickens start laying, their first few normal sized eggs are double or triple yolkers, so I assume when I was getting those boxes of eggs from Whiterow and half of them had more than one yolk, they must have been from quite young hens. Yesterday, Parpy Jo and I went to the farmers' market at Chipping Sodbury. There weren't a great deal of stalls but there were 2 good butchers and we got some bread from Hobbs House Bakery, which apparently has a national reputation. They made the seedy bread I had from Turner's this week. I also got some great-looking sausages which you can expect to see in my OLS meal report next week, and some eggs...Parpy Jo asked the preserves lady, who was also selling the eggs, if they were happy eggs. "Oh yes!" she said, "very happy - they're from chickens rescued from battery farms. When they arrive with us they're miserable and featherless but we soon set them right." Around 7.30pm tonight, all the neighbourhood dogs went mental. We couldn't work out why, until Mr Z slipped outside and counted 17 balloons going over the hills. We're on the route out of Bristol, because they often land on the rugby pitch, and according to my friend Parpy Jo's boyfriend, the wind usually blows this way, so balloons are quite common, but not in such large numbers. We got busy with the camera. The mitten remained unimpressed by the whole thing. After being snarled at by a squirrel on the fence last week, she has been a bit more cautious than normal. We had a feline visitor last week, in the form of a black kitten, wearing a collar and bell, but starved almost into submission. She appeared at Mr Z's workplace and scarfed down 5 packets of kitten food and a whole carton of kitty milk in the space of 24 hours. We moved her into our spare bedroom while we considered what to do. She had no chip, and after 5 days there were no posters up locally, and no cats reported missing with the local Post Offices or vets, so we rehomed her with a friend of Mr Z's colleague. I became quite attached to her in the short space of time she was here - she was really very friendly (as opposed to completely ignoring me for 90% of the time, like Tilly does) and had most unusual paws - she had extra toes, so her front paws looked like real mittens. She would have stolen the name from Tilly. The new owners took her to the vet today. Turns out she's about 6. She was teeny! She can't have eaten in weeks. I hope her old owners don't pine for her too much. I had a good 30th birthday on Tuesday. I spent the day in Bath with Mother Hand: we went to Wagamama's and then walked around getting soaked, sat outside in the drizzle and had coffee, and then eventually went and sat in my car to keep dry. Then in the evening, I went to Waga's AGAIN (love) with aforementioned friend Parpy Jo, and then we went and drank cocktails in Brown's. I love Brown's. I love that they have happy hour cocktails all night, every weeknight, too. We stayed in a very clean, quiet and reasonably priced B&B way up the beach, past the north pier, which was the perfect location: right by the tram, within 10 minutes of town, but far, far away from the rambunctious hen and stag parties out screeching in the streets late into the night. We spent Saturday at the Pleasure Beach, in the surprising sun (the weather was pretty miserable before and after, and I ended up quite sunburnt - again). 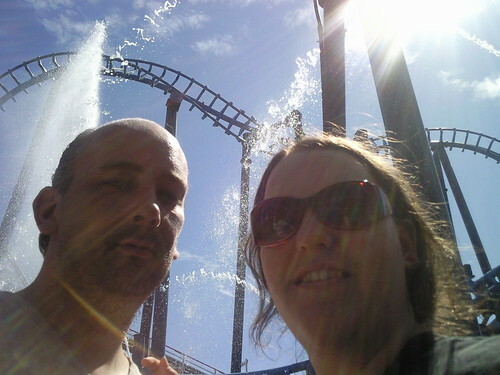 We went on all the decent rides - Mr Z was less than impressed with the Big One, which gave him a pain in the neck, but we both really enjoyed Infusion, which we took this picture next to. It had a pool underneath it with koi carp in. Very strange! I managed to film part of the Big One the second time I went on it, to the admiration of the girls in front of me....but the camera footage would make anybody sick, I think. I have decided I much prefer the Pleasure Beach to Alton Towers. It's slightly cheaper - especially when you consider you can leave and come back again and there are actually places to eat and drink within walking distance; the queues are much shorter (last trip to AT we made it onto 5 rides for the whole day, and that included the chair-o-planes); everything's closer together so you get more time on the actual rides; and I think I even like the rollercoasters better, especially now Infusion is there - it's like a taller, faster version of Nemesis. Plus there's Valhalla, which has to be the funnest log flume ever. This time round, I grinned at the guy vaccuuming the water out of the cars and he bumped us to the front of the carriage so we got first-rate seats ... and absolutely soaked. We were wearing ponchos, but they did not protect us from the wave that swept over the front of the car and drenched our feet. Next time, I will take a spare pair of shoes away with me: I ended up drying them with a hairdryer so I could go out in them that night. I remember the first time I went on Valhalla, with Jen and Richard. Richard terrified the people sitting behind him by turning around and yelling, "SIT BACK!" at them in the middle of the dark bit. It still makes me giggle. After the Pleasure Beach, we walked on the real beach and Mr Z took lots of pictures, and then went out to eat in a nice restaurant where I ate more fish than I do in the whole of the rest of the year put together - and none of it battered, either. All-in-all, it was a great birthday weekend treat and Mr Z retouched the picture I posted 2 entries ago and had it blown up and framed for me to put on the wall of my snug. Long entry! Lots of pictures. One final thing - I cast on today for the aforementioned uniquitous Drops jacket. It's my Ravelympics project, and I hope to get it finished by the 24th August as a result of this. At the moment Im slightly concerned my gauge is off, but I need to put a few more rows on before I can remeasure. I should have a go at that now. I cast on whilst watching the Olympic Opening Ceremony. Very spectacular! I decided I liked the handbags the British female athletes were wearing, but my favourite outfits were the Hungarians' and the Swedes'. I don't know if commenting on the outfits is really in the spirit of the games, but oh well. I came across this blog post today which brings attention to the international campaign to free Tibet, and requested blog posts to spread knowledge of the cause. In the reporting from the games this afternoon, one of the journalists suggested that it was only following the break up of the USSR that China tightened its hold on its satellites. I don't know much about the history, it's definitely something I should read about some more. Even though I disagree that something like the Oympics should be subverted to promote a political cause, I still wonder how the world can be made to notice things like this. I wonder the same about Zimbabwe: should something be done about Mugabe? I conclude, on the latter, that nothing at all can be done, because one might argue that it was European meddling that put Africa in its diabolical situation in the first place. And I wonder the same about Tibet. If it were to become independent from China, would China cut it off and impose huge sanctions, and what impact would that have? Would it be an impact, I wonder, similar to the one on Cuba when it was cut off from America? I certainly support the Free Tibet movement, but I'm unsre about how much can be achieved through foreign pressure. I am more inclined to think that the international community, much like the friend of a woman trapped in an abusive relationship, just needs to hang around and be supportive, rather than getting in there and being threatening. I think no good can come of that. I don't think my opinion would be especially popular, though. After lengthy political musings this week (mostly brought on by a discussion of the American presidential race with Father Hand on my bithday) I have decided that my deal breaker is green issues. I can't think about international policies, they're just too big. That's why I vote: let somebody with more experience and an army of researchers and advisers do that job. As long as they've got it right on the green issues, they've got my vote. Clafoutis, Clapotis....let's call the whole thing off! I know those are two different words but I've made both this week and that song's been going round in my head! The first was part of our anniversary dinner, which is also my entry for OLS week 9. 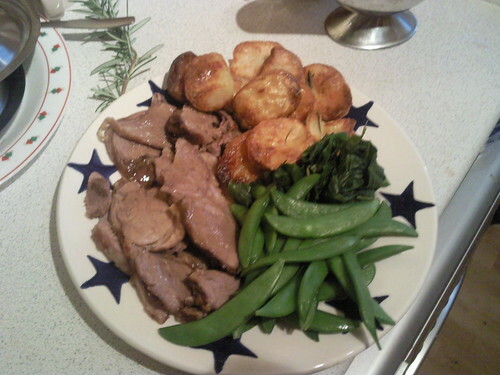 We had roast lamb which I bought from Cooper's, the supermarket near work, who source some their lamb from a farm 2 miles away. The potatoes (which were the best roast potatoes I have ever cooked!) and the mustard spinach were grown at Whiterow and the sugar snap peas are from Turner's. 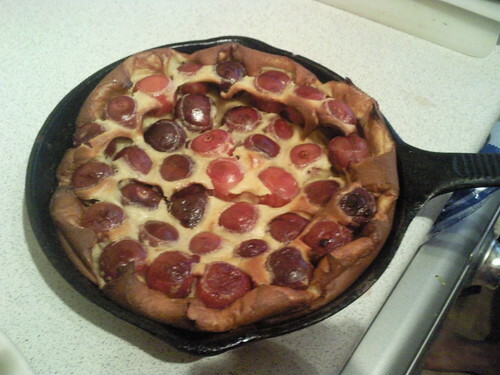 For dessert, I made a cherry clafoutis using local eggs and milk, and served it with local cream which I flavoured with amaretto and a little sugar. There's no local sugar to be had, and I'm not a big fan of honey, so it's not all local....also, the cherries aren't from round here. I suspect they're from Kent. Turner's had a sign on the bowl that said, "English cherries from one of the last growers in the country! Support them while you can!" which seemed like a cause I could place under the locavore umbrella. I'm glad I did - this dessert was delicious. 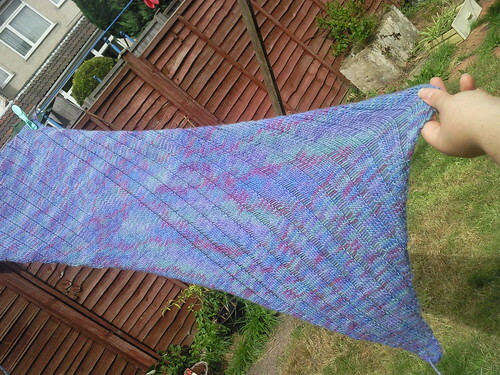 And onto the clapotis! In this picture, only partially complete. Mods: After reading extensively (and there is extensive reading to be had on this project), I purled the drop stitch rows instead of using markers; I skipped one increase row to make sure I'd finish it in 3 skeins; and I knitted an extra 3 repeats of the straight rows (I think....it might have only been 2) when it became clear that I had plenty of yarn left. I was a bit foolhardy there, though, and became concerned I'd run out towards the end. Thankfully it was OK. I now have an extra skein leftover for some handwarmers or something. I also tried ptbl on the wrong side on either side of the drop stitches, but it looked all bumpy and wrong, so I stopped pretty quickly. It was quite quick once I got started on it. Officially it took me 16 days, but I didn't add anything to it for several days, so if I'd been fastidious about doing a repeat every day it might have been quicker. As it was, I was up until 3am doggedly finishing it on Tuesday, once I'd realised that it's really just a scarf and I don't do scarves. Too long and dull. I love it, though. I love the size. I love the pattern. I REALLY love the yarn - I just bought 4 skeins of the August LE colourway from Jimmy Beans as an early birthday present. Here it is on holiday with me in Blackpool this weekend. More on that at a later date.